Here are some facts about the Wright brothers. 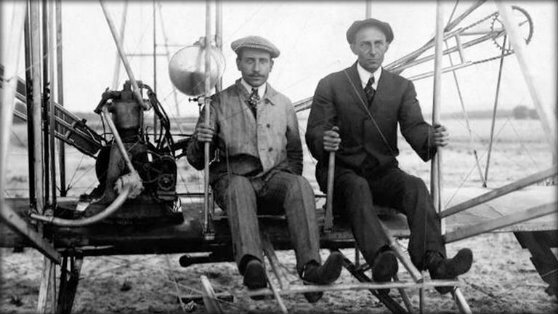 The Wright Brothers, Orville and Wilbur, were American engineers, inventors and bicycle makers. They are famous for inventing, constructing and flying the first aeroplane (or airplane) in the world. Orville was born in 1871 in Ohio, and Wilbur in Indiana, in 1867. They left school to start a printing business, and then in 1892, opened a bicycle sales and repair shop in Ohio. A toy flying machine gave the brothers an interest in flight and aerodynamics. They designed and built several model gliders, and experimented with a wind tunnel. The first flight of the brothers’ Flyer, their plane, took place on December 17th, 1903 in the North Carolina sand dunes. The site was chosen for its soft landing spots, regular breezes and privacy. The fourth flight they made that day lasted 59 seconds and covered about 280 metres. The brothers tossed a coin to decide who would fly the machine first. The Wright Flyer was just over six metres long, with a wingspan of 12 metres. The plane weighed 274 kg and was capable of flying at almost 50 kilometres per hour. In 1909 the brothers created the American Wright Company. They became world famous, made longer test flights and flew in front of the King of England. Orville Wright died in 1948; Wilbur in 1912 aged just 45. Their last home in Dayton, Ohio is now on the US register of Historic Places, and is one of 15 aviation related sites in the area. The Wright Brothers’ Flyer is in the Smithsonian in Washington, DC, although for many years Wilbur refused to donate it. In 1969, Neil Armstrong took a small piece of it to the moon. The Wright Brothers National Memorial in Kill Devil Hills, North Carolina commemorates the brothers’ achievement. A life size replica of the brothers’ 1903 plane can be seen at the site. What next? Discover more facts about famous inventors.